Nearly two-thirds of the drugs on today's market are chiral drugs. Reducing and eliminating their negative characteristics is an ongoing and serious challenge for the pharmaceutical industry. With its well-balanced approach to covering each important aspect of chirality, Chiral Drugs champions important strategies for tipping the medical scale in a positive direction for the production of more effectiveand saferdrugs. GUO-QIANG LIN, is a professor at the Shanghai Institute of Organic Chemistry and an adjunct professor at Fudan University, China. He is the Director of the Division of Chemical Science of the National Natural Science Foundation of China. 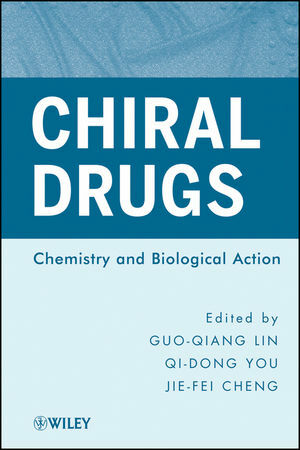 Among Professor Lin's publications are the Wiley books Principles and Applications of Asymmetric Synthesis and Biocatalysis for the Pharmaceutical Industry. QI-DONG YOU, PHD, is the Dean and a professor of the School of Pharmacy at China Pharmaceutical University. He is an Associate Editor of Progress in Pharmaceutical Sciences and serves on the Editorial Board of the International Journal of Medicinal Chemistry and Acta Pharmaceutica Sinica. Dr. You is a coauthor of over eighty publications, and an inventor or co-inventor of over twenty patent applications and patents. JIE-FEI CHENG, PHD, is the Director of Otsuka Shanghai Research Institute, a fully owned subsidiary of Otsuka Pharmaceutical Co., Ltd Japan. Formerly an associate professor at Shanghai Institute of Organic Chemistry, he has worked for over fifteen years in the pharmaceutical and biotech industries in the United States. Dr. Cheng is a coauthor of over fifty peer-reviewed publications, and an inventor or coinventor of over twenty patent applications and patents.